Last fall, McDonald’s for iOS quietly launched a digital stamp card for customers in BC, Alberta, Quebec City area, Quebec, and Halifax, allowing customers to collect McCafe Rewards digitally on their iPhone. At the time, the feature was unavailable to customers in Ontario, but as of today, the feature appears to have launched nationwide within the McDonald’s iOS app. 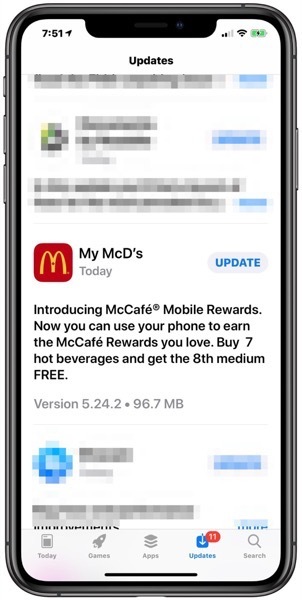 The digital McCafe Rewards card says “Buy 7 hot beverages, get 1 medium hot beverage free.” Customers use the card by letting cashiers or digital order kiosks scan the QR code off your iPhone. McDonald’s customers in BC have had the McCafe Rewards program available for some time now on their cups, available with any hot beverage purchase. With this new digital stamp card, customers can ‘double-dip’ rewards if their region also supports the physical McCafe Rewards program, fast-tracking coffee redemptions. Coffee rewards programs work in Canada, as customers of Starbucks and McDonald’s are well aware of. This national launch of the digital McCafe Rewards program looks to have beat Tim Hortons to the punch, as the latter plans to debut their own loyalty program sometime later this year (maybe they should improve their coffee first #justsayin). Click here to download McDonald’s for iOS in the App Store.